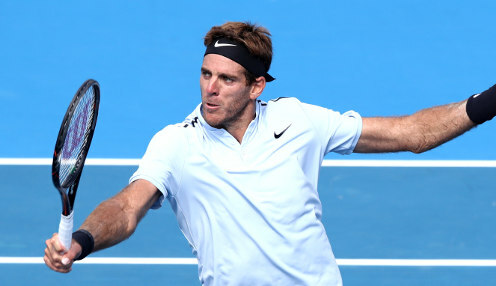 Former US Open champion Juan Martin del Potro looks set to miss the remainder of the 2018 season after suffering a knee injury at the Shanghai Masters. The 30-year-old Argentinian was forced to retire from his last-16 meeting with Borna Coric after taking a heavy fall, with subsequent tests showing that Del Potro had sustained a fracture to his right kneecap. It's a very difficult moment and I feel very sad. A spokesman for Del Potro confirmed in a statement: "The medical studies carried out on Saturday showed that Juan Martin suffered a fracture of his right patella bone in Shanghai. "In the coming days the doctors will evaluate the recovery process needed to return." Del Potro has fought his way all the way back up to number four in the world, having seen his career almost ended by a series of wrist injuries, with the current campaign seeing him reach the semi-finals of the French Open and the final of the US Open. And the Tower of Tandil has admitted that his latest setback, which is all but certain to mean he misses the end-of-season ATP Tour Finals in London, is a tough one to take. He added: "It's a very difficult moment and I feel very sad. It's a hard blow that leaves me without strength." "It's very difficult for me to think about recovery again, I did not expect this to happen." Del Potro is currently priced at 12/1 to win the 2019 US Open at Flushing Meadows, with defending champion Novak Djokovic 5/4 and Alexander Zverev 11/1.